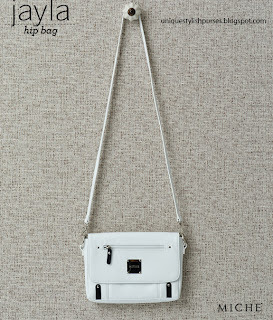 White lightly textured Miche's Jayla Hip Bag has a convenient front zipper pocket. Subtle black detailing and petite rivet accents. The bag is completely self contained and it is not interchangeable like our traditional bags. Long Handles included allows for both cross body and over the shoulder. Length 6". width 9", handle drop 23"